Banks are among the most trusted service providers in the world. And rightly so, they’re entrusted with what people value most – their hard-earned cash. And if customers get even the slightest whiff that a bank may not manage their money efficiently or provide them with a sufficient level of service, they’ll walk out and change banks faster than you can say “I’m sorry”. If you’re a bank manager, you know exactly what I’m talking about. 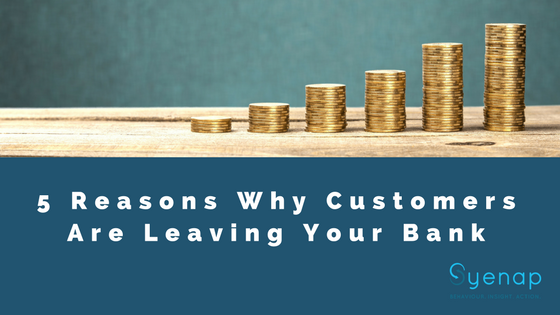 So, to help you keep your customers coming back, here are 5 easy-to-rectify reasons people choose to switch banks. And because Syenap is on your side, I’ve also included the solution for each. I hope you have a notebook ready because you’re going to want to take notes. A sure-fire way to chase your customers out of your bank is making them wait. Ensure sure that your queues are short and move quickly. However, if that’s not an option for you, consider empowering your customers with information on how long they will need to wait. A ticketing system will give them an idea of how long they will need to wait and will help to manage their expectations. Another way to reduce customer wait times is to offer self service alternatives such as ATMs or computers for Internet banking. This will give customers the choice of waiting for service or resolve their query themselves. There are often instances when the number of customers far outweighs the number of employees on shift. This results in slow service and your staff feeling overwhelmed and stressed. You can easily remedy this by identifying your busiest times of day and making sure that enough employees are available both on the floor and at the tellers. There are no two ways about this. Inefficiency is often caused by inexperienced staff. While helping customers is often the best way for employees to learn, this should not come at the expense of customer service, especially during busy times. The solution here is simple: identify the times of day when highly skilled employees are in demand for more complicated queries and make sure enough of them are available. More often than not, a bank’s layout is mapped out based on instinct and assumption. While the bank’s manager may have many years’ experience, instinct is never a match for hard, actionable data. A banking analytics system like Syenap gives you access to right data to optimise the space available. It allows you to see the areas of your bank your customers frequent, and provides you with insight into the best use of that space. Customers are constantly evolving, and their taste in products changes as they grow older or have their priorities shift. So you need to ensure that you can always relate to your customers. For example, if a large number of your customers are young families, consider hiring a home loan specialist. Or if your customers are young, you may want to focus on offering student loans and first time checking accounts. Luckily, with the demographic profiling that Syenap provides, you can easily find out who your customers are and what products or services attract them. This data can be used to optimise your offering and generate interest from the right customers. That’s All Great – What Can We Do? We’ve been at this for a while now (too long to mention), and we’ve seen many banks take our advice and bounce back from the edge of defeat. With Syenap’s banking analytics in place, you get an in depth view of what’s really going on in your bank and can do what you need to ensure the above don’t happen to you ever again. Want to chat to a professional on how to implement Syenap in your bank and start a revolution of your own? Let’s chat.